I just thought it was interesting to show how artists usually have to do a quick character study sketch to get the costume and proportions right. 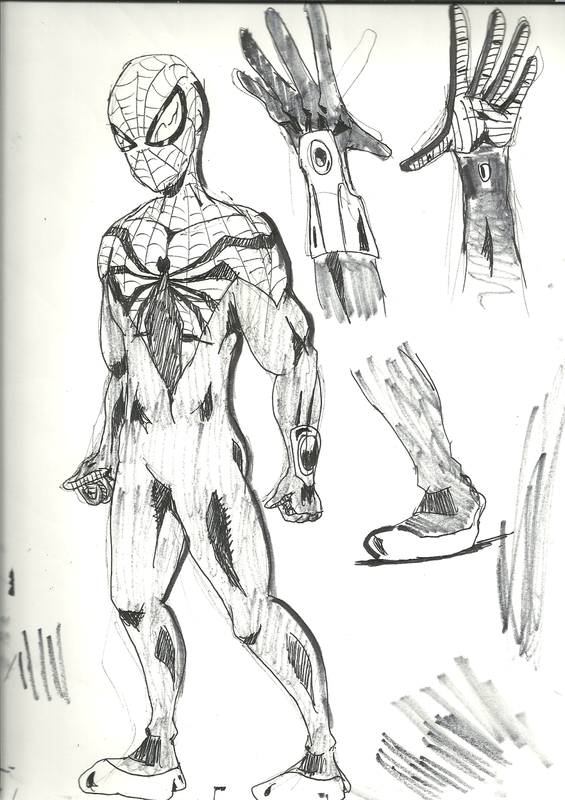 Like I said in my previous post, Spider-Man has a new look, so I had to draw it out what it looked like so I don't mess it up in a real drawing. It also helps to have personal notes that I could refer to like Spider-Man having red toes on his shoes or the odd detail that his gloves are black on the back of his hand but has a web-like, red design on the inside of it. I used a .01 cm thick pen to sketch the body outline and then I went over with a G2 gel pen for the details and shading. I also have random Sharpie marks all over the page because I was testing how dark it was when drawing the previous Spidey picture.